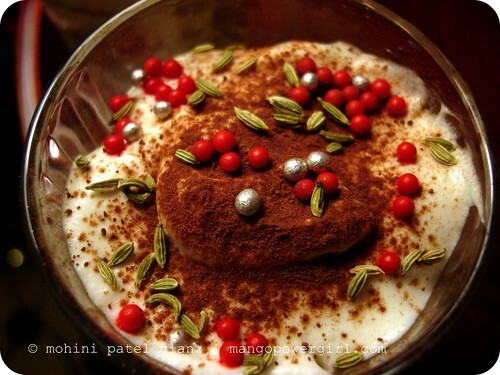 We have a German Santa on our tree, so why not a German Tiramisu in our bellies? I found German spiced cookies called Kräuter Printen in a Bavarian delicatessan at Pike Place Market, made by Lambertz — who have been baking gingerbread for more than 300 years in Aachen, Deutschland! After I did some research and talked to a Bavarian co-worker — who grew up eating these every Christmas season — I found a good story. Printen are traditional gingerbread cookies with a flavor similar to the more famous Lebkuchen, but they are firmer and molded into a ladyfinger-looking shape. Printen were originally sweetened with honey, but now they are made with brown sugar or sugar-beet syrup. Honey had first become unavailable when Napoleon banned all trade with the major honey manufacturer in those days — the USA. Thus the tradition of sweetening with sugar-beets began, and it continues to this day. These Printen have the common Christmas spices you find in German sweets, but I tasted especially strong anise. Printen in general have all or some of: cinnamon, aniseed, clove, cardamom, coriander, allspice, and of course ginger! The Printen I found have bits of brown sugar crystals in them & they taste wonderful. When you try to decipher the ingredient list on the package, to find what exact spices they contain — you don’t find any! It is common for Printen bakers to keep their spice mixtures a secret. This is the same story I’ve found in India — otherwise, everyone’s Garam Masala or Madras Curry would taste the same! My co-worker added that they typically dunk Printen in coffee. They were usually found in Germany’s small bakeries, every Christmas season. She also said they are available in different types — some chocolate covered, with nuts, or with marzipan. If you leave Printen in open air, they turn into rocks hard enough to knock someone out! My Kräuter Printen’s ladyfinger-like shape reminded me that I hadn’t made Tiramisu in a while. 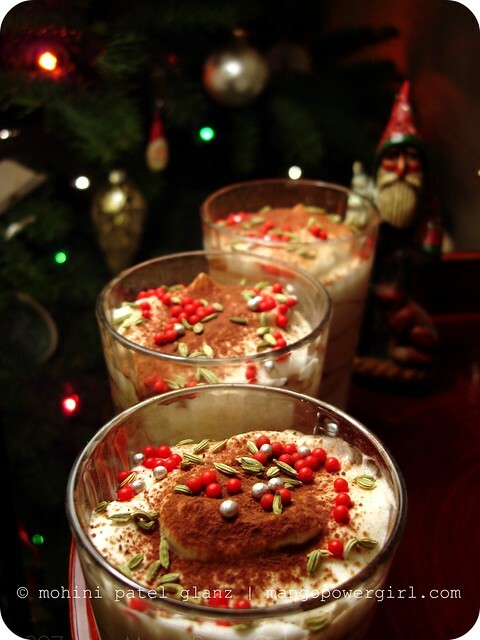 With all those Christmas flavors, too it was a perfect chance for Tiramisu with a German twist. I bought the last few remaining packages the lady at the Bavarian shop had, and I am glad I did as she might never have them again — well, maybe next Christmas! Now for the Tiramisu, which I always make eggless! as I get queasy about eating raw eggs and I also want the non-egg-eating members of my family to enjoy it. I added mint to mascarpone and topped it off with toasted, green aniseed and red and silver, sugar coated anise candy. My Bavarian-German-American in-laws loved this holiday dessert, so I cannot wait to re-create this as a new holiday tradition, next year. The only catch: I’ll have to figure out where to find the Kräuter Printen! Here is my approximation for this Tiramisu — because I did not quite measure, I just eye-balled it. 1. Make fresh espresso and let it cool completely. 2. Whip the heavy cream with sugar and mint extract till stiff. 3. Whip the mascarpone with a few spoons of espresso. 4. Slowly fold the cream into the mascarpone, a few spoons at a time. You don’t want to kill the fluffiness! 5. Based on the serving dish you are using, either keep the cookies whole — or for example, cut them into thirds like I did, to serve in narrow glasses. 6. Quickly dip each side of each cookie in espresso, and place them in your dish. 7. Pipe or spoon in the mascarpone mix, forming one of what will be several layers. 8. Dust cocoa over the top of the layer. 9. Repeat 6-8, forming layers till you reach the top of your dish. 10. Refrigerate for at least an hour before serving. 11. Sprinkle with anise candy, toasted aniseed, or you may try crushed candy cane or any other festive topping before serving. Enjoy and have a very Happy Holiday! Mom – Thanks! I am so glad you all enjoyed it…and thanks for stopping by to comment :)Thank you Sagari & Keren! Very informative and lovely shot. I like the sprinkles idea!Happy New Year in advance. Thanks a lot M&Ms! Happy New Year to you as well!! This sounds absolutely gorgeous. Great pics too. Margot – Thanks a bunch – let me know how it turns out if you try it … you might want to meddle with the measurements to your taste ;)Thanks a lot Amanda!